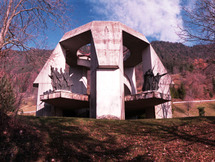 Boris Kobe is considered one of the most significant Slovenian architects and designers. He was trained at the University of Ljubljana, where he trained under Jože Plečnik. He graduated from university in 1929. For the next ten years, he apprenticed at architectural firms around Ljubljana developing his skills as a designer. However, at the onset of World War II, he was imprisoned at the German Allach concentration camp, the largest sub-camp of Dachau, 16km northwest of Munich. While imprisoned at the camp, Kobe notably created a set of hand-drawn tarot cards, which depict the macabre daily life experienced at the death camp. After surviving the camps at the end of the war, he continued on with his architectural career and created no other artistic works known related to his time in the camps. In 1946, he collaborated with Plečnik to renovate a 15th century tower of Ljubljana Castle. For the next several decades he worked on designing and renovating public monuments and parks across Slovenia, from Ulrich, to Tivoli Pond, to Ljubelj, to Graz. 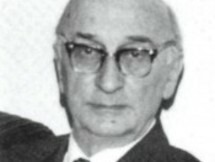 In addition to his architecture, he also was a renowned painter and illustrator, for which he won a Levstik Award in 1952 when he illustrated a new edition of Tavčar's "The Visoko Chronicles". However, one work that he might be most known for is his part in creating the Monument to the Battle of Dražgoše in the hills of the Julian Alps in 1970. 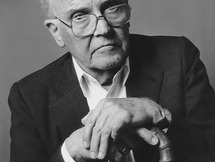 In 1977, he was granted the Grand Prešeren Award, Slovenia's highest honor for those who have dedicated a lifetime of work in the fields of arts and culture.